Threave got the game under way on a very cold winters afternoon but soon found themselves pinned back in their own half as Gretna pressed for an early goal. Brandon Longcake attracted the attention of several markers having enjoyed teasing the Threave defence in a previous meeting at Meadow Park earlier this month. Indeed most of the home sides attacks came down the left with Joe Slattery operating on the opposite wing. First chance for the home side came in opening minute when Scott Milligan put Longcake clear in behind the Threave defence but Vinnie Parker forced the Gretna winger into an early shot which was just the wrong side of the post. Minutes later Iain Anderson fired across the Threave goal just missing the far post. Slattery then had a goal bound effort blocked and turned behind for a corner as the home side continued to dominate. Jonny Blake got in behind the Threave defence when he linked up with Slattery down the right wing, his cross was met on the volley by Milligan but his shot was well over Parker's crossbar. In the 15th. minute Threave had there first chance when Colin Kay crossed into the Gretna box where Jamie Struthers out jumped Dave Wallace but his header was off target. Adam Main had a 25 yard effort saved on the line by Parker while at the other end Graham Wright comfortably saved a long range effort by Greig Goodwin. Gretna had the larger majority of possession but were unable to convert into goals. Threave were defending deep inside their half and offered little in attack. Just before the interval Slattery blazed a shot wide from 20 yards through a packed penalty area. H/T 0-0. The second half began with the home side on the attack and twice in quick succession Parker denied Slattery at point blank range much to the disappointment of the young Gretna forward. Threave looked as though they would hit Gretna on the counter but Wright was in no mood to concede and was instrumental in delivering quick ball for his midfield to attack. One long throw out found Main on half way which resulted in the Gretna midfielder bursting through the Threave defence, unfortunately his shot was straight into the arms of Parker. Play became a little bit untidy with both teams surrendering possession easily, on 65 minutes Gretna manager Stuart Rome made his first substitution , Sam Atkinson on for Greig Thorburn. With a reshuffle of his defence Atkinson instantly became chief provider down the right wing. 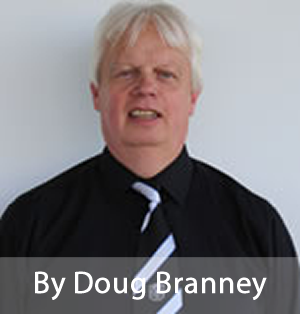 In the 75th minute Gretna were awarded a free kick after a poor challenge by Kay on Longcake around 25 yards from goal. Alan Inglis' free kick almost knock out Goodwin who was part of the Threave wall. In the 79th.minute an Atkinson out swinging corner in around the penalty spot saw Wallace rise above the Threave defence to head onto Inglis who in turn looped his well flighted header beyond Parker and into the top corner of the net, 1-0. Rome made his final substitutions with Nick Cassidy and Danny Graham replacing the hard working pair of Adam Main and Joe Slattery. 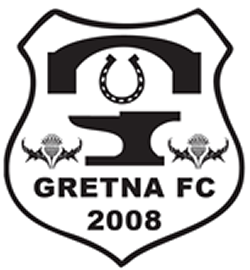 Final score Gretna 1 Threave 0, the result means Gretna move into the next round of the cup. V.Parker, C.Kay, K.Roan, S.Wilby, L.Patterson, A.Forsyth, G.Goodwin, C.Docherty, R.Parker, J.Struthers, I.Miller. Subs: S.Milligan, D.Few, K.Jackson, A.Donley.